Rainbow sandals are very popular and known to be very comfortable, but at a price. and who knew that price would be confusion. So one night, I had friends come over. It was a warm night, and so everyone decided to wear sandals, and guess what, we all owned the same pair. 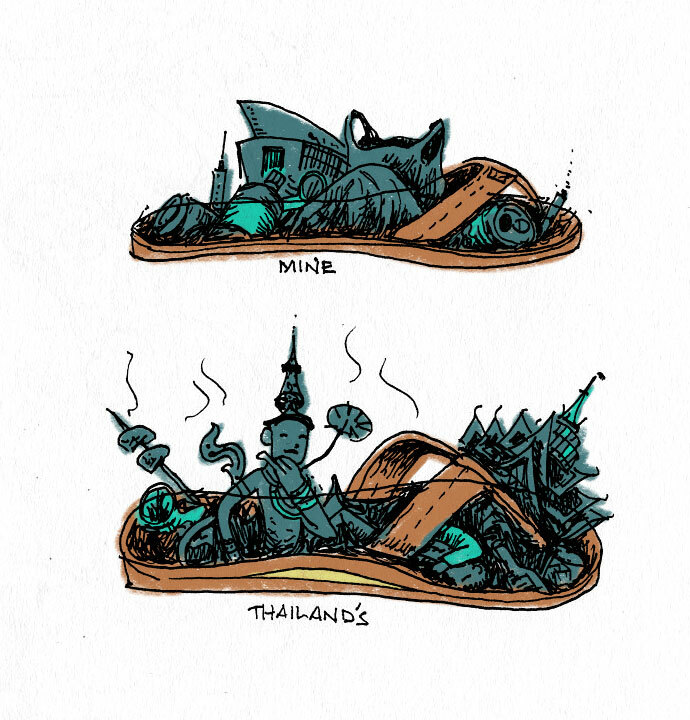 you can really only distinguish your sandals from another by the subtle difference in the wear of the sole. and that wear does not look pretty... If you own one, you know what I'm talking about. It turns black. well, the next morning, I go to wear my sandals and when I slipped it on, it felt different. and the wear didn't look right. Someone took my sandals!? and the guy who took it just came back from Thailand. I kept picturing where he walked around in that sweaty sandal out-of-country. i felt really uncomfortable wearing it the whole day. It's like wearing someone's used clothing, but worse because how often does one wash sandals?